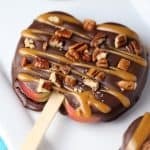 Have you ever had a candy apple but wished there was a little more “candy” in each bite? Problem solved! 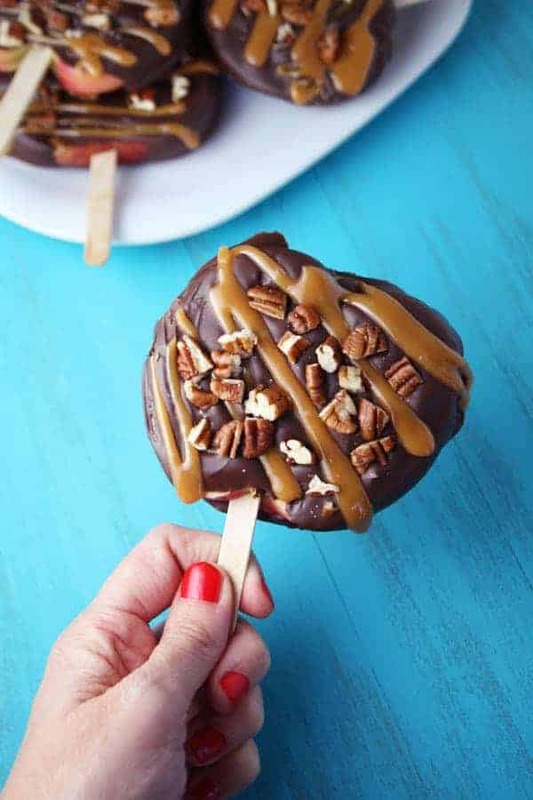 These candy apples are covered with all of the ingredients in my favorite candy – chocolate turtles. Click here to watch the video tutorial – How to Make Chocolate Turtle Apple Slices. Note: If you're concerned about biting into an apple seed, just remove them before dipping the apple slice in chocolate. Featured on the Southern Plate Meal Plan Monday #85! Does the chocolate have to harden first before you drizzle with caramel? No, it’s actually better if it’s not hard, so the nuts will stick. I love this idea and can’t wait to make them for my Bible Study group. This is such a creative idea!! great use of apple after all the fall apple picking! So quick question does the semi sweet chocolate work better than milk chocolate?? I think milk chocolate chips would work too. Just make sure to follow the package instructions for how to melt the chips. Is it necessary to add the coconut oil to the chocolate or can I omit it? Yes! 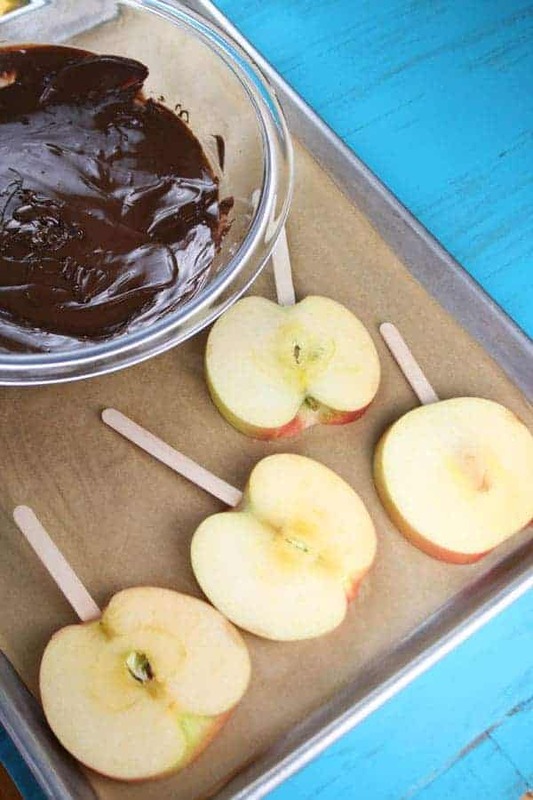 Adding the coconut oil makes the melted chocolate much smoother and easier to dip the apples in. I can’t wait to try these. How long do u think they will last before apple turns brown? I’m wanting to make them and then mail them to a friend. I was wondering the same thing I wanted to make them for our bake sale. But I am not sure I could do it that morning. 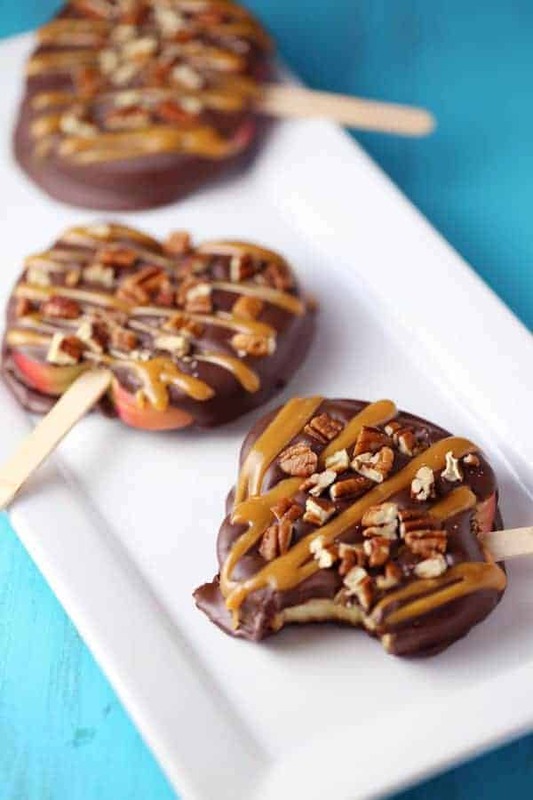 Apples don’t freeze well, but since they are covered in chocolate, they will last for a while in the fridge. At least 3-4 days. These look AMAZING! Thanks for sharing at Meal Plan Monday. You can use butter instead of coconut oil. 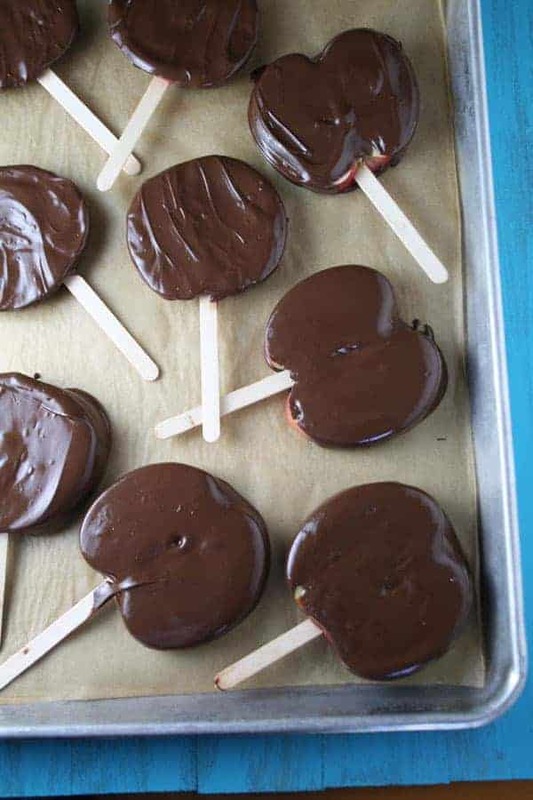 I’ve read horror stories about apple pops (using a melon baller to make balls then put them on a stick and dip in chocolate), the chocolate won’t stay put because the apple is wet, since there is no peel. Does this happen with these? I didn’t have this problem when I made them but they are best if eaten within 24 hours of making them. After that, the moisture from the apples will affect the chocolate consistency. This would be awesome for a classroom party as a home room mom! That’s what happened to me when I tried to make these. 🙁 it turned into a slippery chocolate caramel mess. Still tasted good, though. Does chocolate n caramel harden to put in wrapping cello bags? You could store them in plastic bags, but they need to stay refrigerated and they are best if eaten within 24 hours. This did not turn out well for us. The caramel got so hard we were afraid we would break a tooth or pull out a filling. It didn’t take long before the juice from the apples made the whole thing a sticky mess. The chocolate on the bottoms stuck to the wax paper. I will not do this again. I’m sorry it didn’t work for you. Some suggestions: use parchment paper instead of wax paper. Also, I used Nestle Tollhouse chocolate chips, then melted them. You have to be careful when putting chocolate in the microwave. If it overheats, it will get weird. Same for caramel. You can’t heat it for too long or it will get too hard. Can I use butter, margarine or even corn oil instead of the coconut oil? 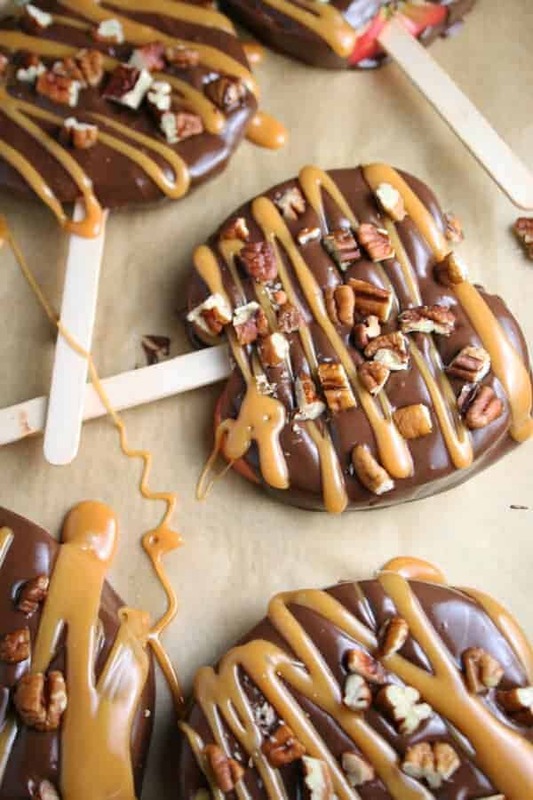 Could you cut out the core and fill with Carmel before dipping in chocolate? Good question, Vickey. I think you can just eat around the core. Sort of like eating a whole candy apple or eating any apple. These look awesome! I can’t wait to try them. All are good comments about the moisture of the apple as with any fruit. I would try to Pat with paper towel till I get the chocolate on. Wish we knew secret to the company of Edible fruit baskets. Anyway my concern was choking on the core in the middle can that somehow be cut away and still maintain stability? You have a fantastic site thank you for your hard work!! As for the core, I think you can eat around it. Sort of the same way you eat around it on a whole candy apple. These look amazing. Do save time, do you think you could use premade caramel sauce? I just don’t know if it would harden. Thank you! I don’t think that would work, Cyndi, but you could try it. I made this but used an apple corer and treated the wedges the same way. I omitted the popsicle stick and It made smaller servings but still worked very well. Loved these, was a hit with the grandkids! Used sprinkles instead of nuts, turned out great! These were a no go for me. First off…I made a bunch of them and didn’t think about the refrigeration part. I was skeptical about putting chocolate covered fruit in the refrigerator as you can’t do this with Strawberries. Anyway, I did put the apples after dipped on parchment paper but I had to move them to a cookie sheet to refrigerate. Probably the main reason they failed. They was super cute but a sloppy mess on the underside. They were tasty but I couldn’t get beyond the runny apple and I would never serve them. I will take a few to our office but the rest went in the trash. Another note, I probably would have used Granny Smith apples. I only got about 5-6 slices from one Fuji apple so the 10-12 slices at 1/2 ” was not accurate for my apples. Hi Laurie, I’m sorry it didn’t work out for you. It’s best not to move the chocolate dipped apples until after the chocolate has hardened. Also, I used very large Fuji apples. I’m definitely going to try this, but I’m allergic to coconut. What other oil could I use that would work well? You can use vegetable oil instead of coconut oil. That would work just as well. I added the oil to make the consistency of the chocolate more smooth and easier to dip the apples in. I found this recipe on pinterest, and I think it is a fantastic idea. Thankyou. I will let you know hiw they turned out. Hi Tracey, Keep in mind that one recipe makes 10-12 apple slices. Enjoy! 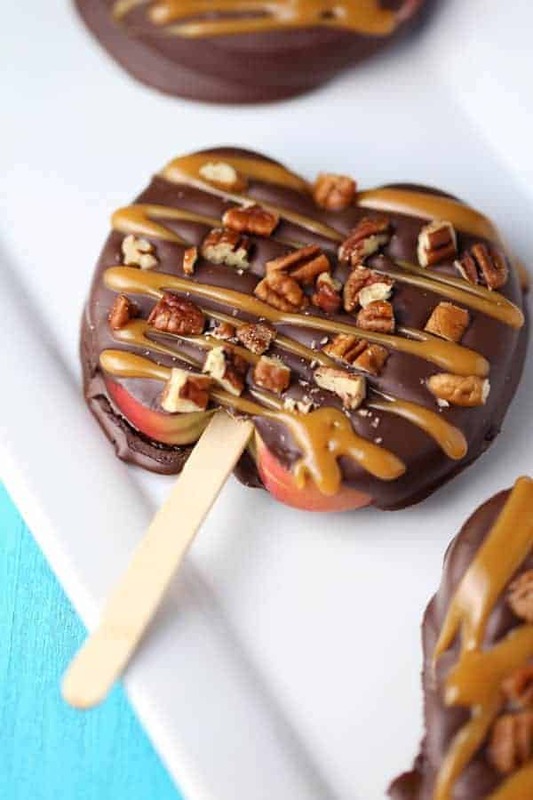 This is kind of like a reverse caramel apple! The more chocolate the better, I love this idea! Oh you had me at Fuji apples – those are my favorite! These look wonderful. Thanks so much for sharing in the Sips and Sweets Linkup. Hope to see you at the Twitter Party! Do you think a very small amount of corn starch sprinkled on apples would help with wetness Issue? Maybe but it might stick to the chocolate and not look so pretty. These did not work for me – big mess. The chocolate did not harden on the bottom even though I used parchment paper. The caramel was too hard. p.s. Did you try refrigerating the apples to get the chocolate to harden? Also, the caramel will get too hard if it’s overheated. I would like to use this recipe to make turtles do you think it would work? 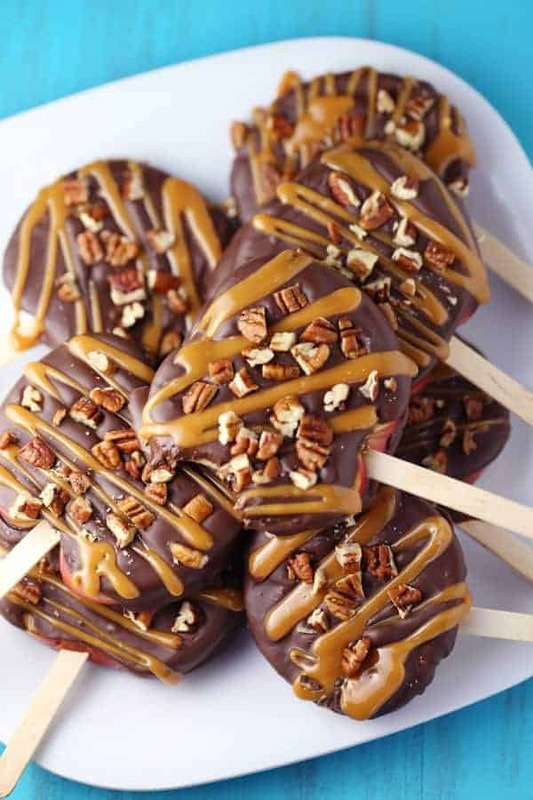 Pecans then caramel and then the chocolate. I’m loving these apple slices! 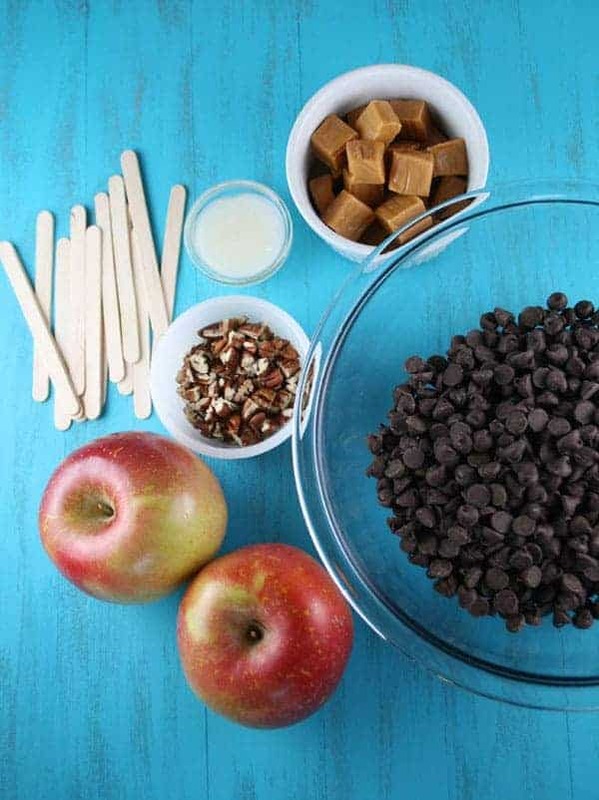 Such a fun way to eat a caramel apple! Can’t wait to try them! I was wondering if I can leave them in the refrigerator over night? Yes, that would be fine. They are best in the first 24 hours. Muszę sie wam pochwalic w koncu zrzucilam – 6 kilogramów. They would be best in individual plastic bags and stored in the fridge. But honestly, they are best the first day (as stated in recipe). You can still eat them after a few days, store in the refrigerator but the chocolate starts to come off from the moisture of the apples. Good luck!